Data analysis as part of business intelligence solutions is a growingly demanded needs. Unfortunately in most transactional systems, rarely data is organized in an effective and efficient aggregates. In those cases, producing an analytical report require an exhaustive and time consuming efforts. Thus, to successfully build a comprehensive BI solution we need to transform our transactional data into analytical friendly format, i.e. Multi Dimensional Modelling. The transformation is usually stored in a data warehouse. Of course, usually in data warehouse process we use ETL (Extract, Transform and Load) to help us in productivity. Pentaho Data Integration (Kettle) is one of the most popular ETL tool and is open sourced. This course presents an overview of data warehouse, multi dimensional, ETL concept, the extensive use of Pentaho Data Integration to build a powerful data warehouse solution. The practical approach of this course involved many cases we face in our daily jobs so that we can get a highly valuable skills from attending the course. understand the basics of Pentaho Data Integration. PC or Laptop with minimum of 2GHz CPU, 1 GB of RAM, DVD Drive and 2 GB of available hard disk space. Online Transaction Processing (OLTP) and Online Analytical Processing (OLAP). Delivering Solution with ETL (Extract, Transform, Load) Tool. XAMPP package (Apache HTTP Server and MySQL). Relation between job and transformation. 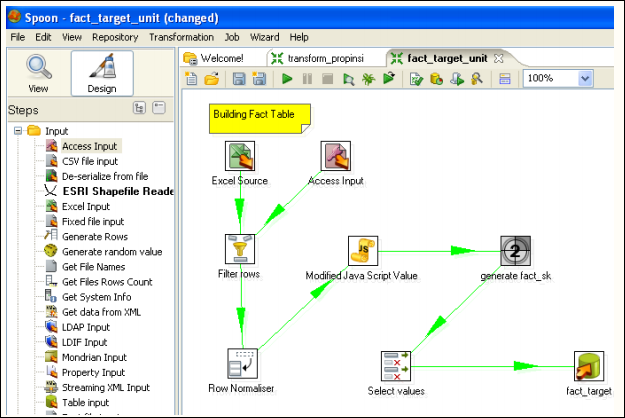 Create a Kettle transformation to map PHI-Minimart transactional database sample to dimensional modeling database. Create logs for each steps. SQL Server 2008’s CDC feature demonstration. Slowly Changing Dimension to solve master data historical problems. Typical Situations where Late Arrival occurs. Best practice of Late Arrival’s handling. Create a currency staging table to solve sequential dependence problem. Create a dynamic tables dump using variable and looping control. Refining existing transformations to use email alert. Using Windows Task Scheduler to schedule ETL running job and transformation.